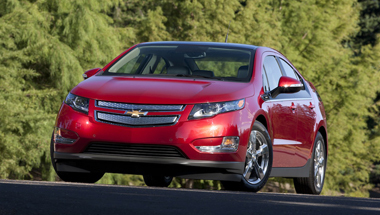 The Chevrolet Volt represents a voyage into uncharted waters for both General Motors and automakers in general. 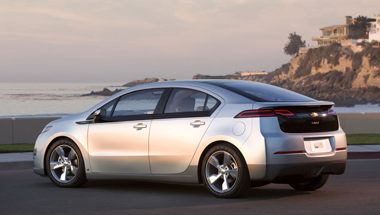 The new Chevrolet Volt is a four-passenger, five-door compact hatchback plug-in hybrid electric vehicle. The motor is coupled to two power sources - an advanced lithium-ion battery pack and a four-cylinder internal-combustion engine. For (up to) the first 40 miles, the vehicle drives gas- and tailpipe-emissions-free using electricity stored in its lithium-ion battery. When the Volt's battery runs low, a gas-powered, engine/generator seamlessly operates to extend the driving range another 300 miles on a full tank. The Volt's lithium-ion battery pack can be charged by plugging the car into a 120-240VAC residential electrical outlet. No external charging station is required. After the Volt battery charge drops to about 35% of full charge, it switches to extended range mode, when a small 4-cylinder internal combustion engine burns premium gasoline to power a 74hp generator supplying the electrical power to extend the Volt's range. In addition, while in extended range mode and travelling at highway speeds, the engine can engage mechanically via a clutch to combine with the electric motors for propulsion. The electrical power from the generator is sent primarily to the electric motor, with the excess going to the batteries, depending on the state of charge (SoC) of the battery pack and the power demanded at the wheels. General Motors has avoided the use of the term "hybrid" when describing its Voltec designs, even after it was revealed that in some cases the combustion engine provided some assist at high speeds. Instead GM describes the Volt as an electric vehicle equipped with a "range extending" gasoline powered internal combustion engine (ICE) as a genset and therefore dubbed the Volt an "Extended Range Electric Vehicle" or E-REV. 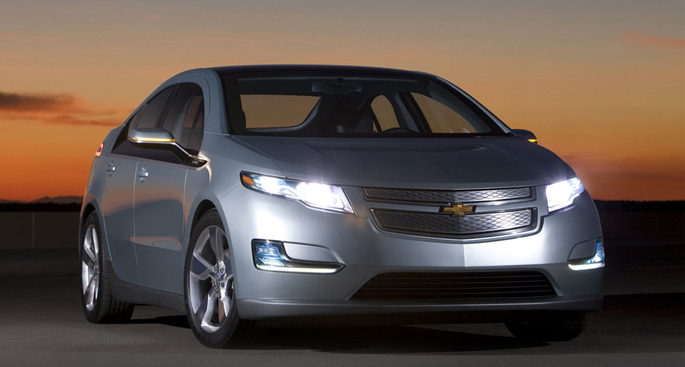 The external design is supplemented with superb Chevy Volt Accessories. Standard feature highlights include a fixed glass sunroof, a full complement of airbags, stability control, keyless ignition/entry, OnStar automatic climate control, a split-folding rear seatback, Bluetooth, a voice-activated navigation system and a Bose six-speaker sound system. Leather upholstery and heated front seats are optional. A Volt owner can monitor the car's status and set charging times through an online Web portal or a mobile phone. There are two large display screens, one directly in front of the driver, and one at the top center of the instrument panel, and between the two screens, there is every kind of technical information about the operation of the car, plus navigation and entertainment on the center screen. The very large speedometer numbers dominate the driver's screen, with the normal gauges arrayed around the corners, a battery depletion gauge on the left, and a floating virtual Earth on the right-hand side, the idea being to keep the Earth centered at all times for best battery life and best energy usage. The Volt is as modern and different on the inside as it is on the outside. On cloth-seat base models, the door panels and other trim are metallic, but if the premium package is ordered, those panels become wildly graphic, including the dashtop. Either way, the interior looks very modern, the materials and graining are very well done, and there is plenty of light coming into the car from the large windows. There's a high-tech gauge readout behind the steering wheel from CARiD.com and a swoopy center stack that looks like an oversized high-end electronic device.